← What really happens when you use body spray? Gatorade is America’s number one sports drink year in and year out. Their success can be traced back to the successfulness of their advertising campaign over the years. A staple athlete that has been sponsored by Gatorade for his entire career and into his retirement is Michael Jordan. Known for his greatness on the basketball court and style off of it, Jordan is currently the face of Gatorade’s newest campaign. “That’s G” is Gatorade’s current advertising campaign to attract new customers as well as maintain the old ones. Jordan is now the face of six signature flavors ranging from berry cherry blend to just regular berry blend. All of these bottles feature a picture of Jordan and the signature names, “Championship Blue” or “Championship Red” and so on. Drinking these drinks will give you Jordan like ability and celebrity status wherever you may go, except not at all. In the September 7th issue of ESPN the magazine there was an ad featuring Jordan for the “That’s G” campaign. This is not your typical one page full color ad with the Jordan silhouette which practically sells itself but rather this ad folds out into a full two page, double sided ad. The front is the main focus and the side that features Jordan in all his glory. It is a picture of him high flying through the air on the way to the hoop for a dunk. His mouth wide open a staple in the Jordan basketball years of his swagger on the court. His face is excited, he is ready to make this dunk and give the fans what they came to see. There is no worry or uncertainty on his face but rather just pure confidence. Jordan was always borderline cocky but who could argue with him, many have called him the greatest to ever play the game. The muscles of his legs are clearly evident as they propel him forward to his goal. The bright blood red of the Chicago Bulls’ uniform contrasts his black skin and accentuate him in his muscularity. The odd part of this ad is that the crowd behind him is not featured in color but rather it is black and white. You cannot make out any face or anything about the people in the background. Jordan’s figure is the only feature of the ad and the crowd in the background could as easily have been a plain black screen. Gatorade does this however to show that all eyes are on him. In that moment before he scores nothing else matters besides him. He is the king and everyone in the arena is forced to focus on him. Then there is the text, “That’s G” which is pasted over Jordan’s body. “That’s G” is printed in large white text over the center of Jordan’s body. This is an odd place for the text. Usually located in a corner of the ad, with the text in the center it is hard to miss. It is clear to the reader what the ad is selling and that is Gatorade because the “G” is in fact Gatorade’s new logo which consists of a “g” with a lightning bolt. But the text also raises questions about Jordan and Gatorade itself. Is Jordan’s athletic ability and achievements are they all thanks to Gatorade? The ad itself would suggest this. 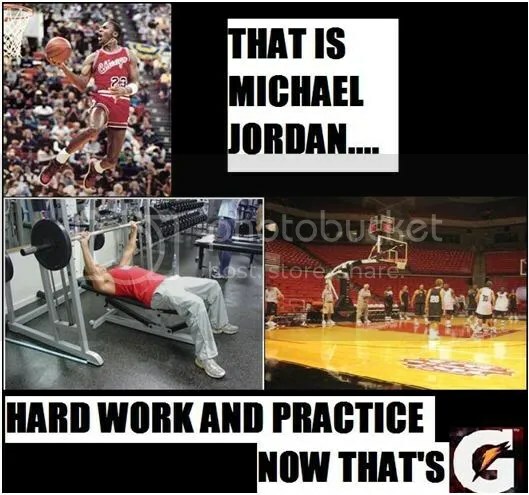 Rather than hard work and practice the ad is saying that with Gatorade anyone can become Jordan. The back side of the ad is images of three of his six Gatorade flavors. The background of the ad is black and draws attention to the bright colors of the Gatorade. The red, blue and yellow colors form a great contrast to the black backdrop. Each features a picture of him and a short paragraph about one of his accomplishments he has had of his illustrious career. The bottles are also dripping wet with water. The water represents sweat and tears, two key concepts in become successful. A person has to go through hard times and struggles before become great. This image is different than that of the front of the ad where everything is all about Jordan and his greatness. Above the bottles is a paragraph explaining “What’s G” in respect to how Jordan has epitomized the phrase. “When you’re the best offensive player in the world and you make the all-NBA defensive team 10 times…that’s G.” G is very vague in its existence. Will “that’s G” someday replace more common sayings like “that’s cool” or “that player is dirty?” or is “that’s G” just apply to Jordan and his feats and accomplishments? This ad does a great job attracting consumers to the product because it works on so many different levels. Sports drinkers will continue to drink Gatorade no matter what their ads are. The only difference between Gatorade and PowerAde is taste which people themselves can determine which is better. Basketball fans will look at this ad and be inspired to buy Jordan’s Gatorade flavors because he is an icon in their sport. His legacy will prompt people to collect the 6 once in a lifetime bottles. The main focus group of this ad however is athletes across America. From teenagers to adults anyone involved in sports is tempted to try these Gatorades with the false hope that maybe they can be like Jordan, maybe they can be a “G.” it is the athletic demographic that is most impacted by this ad campaign. 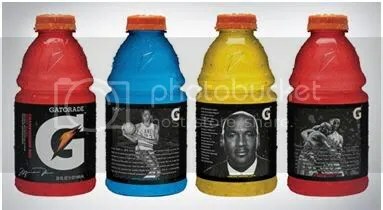 Although in people’s minds they know a sports drink will not make them the greatest basketball player of all time but that is what Gatorade is selling so that is what the customers are buying. Maybe this drink will make them one step faster or give them ability to jump one inch higher is often what goes through consumer’s head. Gatorade does hydrate athletes and gives them the ability to perform athletics without cramping and prevents dehydration. It does not impact in anyway the ability of the athlete. The target group ad is teenage athletes and therefore the anti ad will also be directed at their demographic. Athletes see advertisements like this and are prompted to buy the product that does not do what it is selling. On Gatorade’s website it says, “When athletes sweat, they lose electrolytes such as sodium, potassium, and chloride that are essential to hydration and muscle function. Unlike water and other beverages that are not scientifically formulated, Gatorade is lab-tested to ensure it replenishes the electrolytes lost in sweat while maintaining thirst so athletes will adequately ingest enough fluid and electrolytes to stay well-hydrated.”(Gatorade.com) it says nothing about making you like Michael Jordan but rather just talks about hydration. Muscle magazines feature a countless number of ads for supplement that feature large, defined body builders. The problem with the ad is that the body builder most likely took steroids and not the supplement that they are selling. Same thing happens here with the Jordan ad although it is less extreme. Jordan spent his entire life to get to the pinnacle of his career. He was cut from his high school basketball team and vowed to be the greatest ever. It was this vow that led to his dominance and greatness not Gatorade. Athletes need to be aware of what they are buying and need to focus on the product not on the great athlete selling the product. Just as in the print ad, Gatorade uses star power in the commercials as seen below. The ad stars legendary college basketball coach John Wooden as the narrator and features video clips of Dwayne Wade, Kevin Durant, Bill Walton and of course Michael Jordan. All of these men were great college as well as professional basketball players. My anti-ad is very different from the ad featured up above. It combines new elements and messages that actually apply to the athletes it is selling to. Yes, Michael Jordan is still present in my ad but in a much diminished way. He is no longer the sole focus of the ad and the “That’s G” tagline is removed from him. Now my ad features a basketball practice and a person lifting weights, two key elements in become better athletes. Just by adding these two new pictures it changes the entire message of what being a “G” is. “G” is not what is given to you but rather it is what you work for day in and day out to become the best you can be. The ad is no longer selling Jordan but rather it is selling Gatorade and its ability to help athletes stay hydrated. Gatorade did not make Jordan who he was a player but rather it just helped him perform night in and night out. “Hard work and practice” are now the words that go along with “G” rather than Jordan. Athletes today need to separate what they see in front of them in advertisements from what is truly being sold to them. Michael Jordan is the new face of Gatorade with countless other professional athletes but simply drinking Gatorade will get you nowhere. However, there are benefits to drinking Gatorade. It can help you stay hydrated when you are working hard in practice or in games. Because companies refuse to market what they are actually selling it is the job of the consumer to separate what they are being sold from what they are actually buying. I hope that my anti- ad shows you are not buying Michael Jordan abilities but rather a product that can help you in your quest to be like Mike. Maughan RJ. Fluid and electrolyte loss and replacement in exercise. J Sports Sci 9:117-142, 1991.